In River of Empathy, I described music’s ability to establish empathy, and build bridges between diverse cultures. This principle threads itself through everything I feel is important and beautiful about the arts. It guides my life as a listener and record collector. That theme also brings us to our next exploration. Indian Classical music is one of my great loves. Its tones, rhythms, and melodies move me beyond words. It’s a constant in my life, and has often saved me from my darkest depths. Beyond my affection, it is one of the areas of my collection that people express the most interest in. The body of this music is vast and largely neglected by western listeners. Many people are interested in it, find it beautiful, but don’t know where to begin. I will attempt to offer the simple gesture of introduction. Like most people, outside of India, the first time I heard Indian Classical music was in a restaurant. Despite my overwhelming love for Indian food, this music – often playing in the background, distracted and consumed me. When I first encountered it, many meals were had, straining my ears, with little attention given to my plate. I had no idea what I was hearing, wanted desperately to hear more, but didn’t know how to begin exploring it. It was another world. Years drifted by in this stasis, until the era of the music blog arrived. Though I use the internet for research, I’ve never been engaged with the idea of file sharing. I love the physical object of music and have only rarely listened to downloaded media. I don’t like the interface. I love digging through crates, and would rather listen to less, the way I prefer, than have endless quasi-ownership of files on a hard-drive. I understand the argument and convenience of a non physical format for music, it’s just not the way I enjoy relating to it. In addition to this, file sharing is often an ironic extension of extreme capitalism – something I take great issue with. Consumption as a given, a self-actualizer, and for its own sake. I use blogs as indicators and deposits of information – shared freely, rather than a mechanism of greed. Around a decade ago, on one such blog, I came across uploads of Indian classical records and tapes. It was the first time I downloaded anything, and I went down the rabbit hole – downloading dozens of recordings. I was incredibly excited. I finally had a place to begin – a means to explore this music. I heard things I liked, and things I didn’t. Wonderfully, I couldn’t explain why these recordings resonated with me, or what my reaction was based on. They were a mystery that drew me into its depths. My relationship to the music of India was, and still is, incredibly intuitive. Despite the hundreds of Indian Classical records I’ve assembled in my collection and the countless hours I’ve spent listening to them, I still have few words to describe my relationship to these sounds. It is my heart that guides me. I’ve made an effort to learn, but I still know relatively little about Indian Classical music. It is an incredibly complex, diverse, and nuanced tradition. Like its musicians, I would have to dedicate my entire life to study, in order to do its beauty justice. I hope my efforts will offer some entry into this incredible world. I’ll do my best to transfer some relevant aspects of what I know, while trying to keep it simple and not overwhelm. Please forgive my limitations where they might fall – they are vast. Because I am writing from a western perspective, for western listeners, and because of the dynamic differences between western music and music from India, this is likely to be a significant undertaking, both to write and for the reader. Even with constraint, there will be a lot to process. I hope your relationship to the music will be primary, and that you will fall in love with these sounds just as I have. A developed understanding of this music cannot be expected in a broad stroke. It takes time – arguably a lifetime. I hope you will read it through, seek out the recordings I recommend, and begin your exploration on your own terms. This piece of writing, because of its inevitable density, is both intended as an indicator of where to begin exploring Indian Classical music, but also with the hopes that you might find it useful to return to as a reference as your explorations develop. Western listeners should dispel presumption. Not only are the musical traditions in India far older than our own, but are (from my subjective point of view) more advanced, enlightened, and are drawn from a deeper source of a musician’s humanity. The way this music comes into being is distinct and almost completely absent in the West. My own eurocentricity has been a great limitation to acquiring developed understanding of what I was hearing. I advise everyone to spare themselves the weight under which I labored. Dispense all you know, open your ears and heart – begin again. Indian Classical music has two primary and distinct traditions – Hindustani which derives from the north, and Carnatic which is southern. Hindustani is more familiar in the West, as its players have had a stronger following outside of its country of origin. Both traditions have their roots in spiritual devotion and share many consistencies, but the approach, both musically and spiritually, can often vary radically. Both are primarily focused on the playing of ragas, which are harmonic modes (a constrained set of notes around which a melody is structured) played toward a specific meaning, in conjunction with talas (rhythmic cycles). Though musicians do sometimes contribute new ragas, the primary ragas in both traditions were not composed. They evolved and were passed down over many centuries. Most ragas are written to be sung. This means, when the music is instrumental, its harmonic relationships derives from the human voice, and its meaning is brought to realization in a similar way to how it might be articulated with a voice. An instrument is intended to imitate a voice – thus when you hear a sitar, or any other instrument, it is singing rather than simply being played for its distinct character. Ragas do cross between the traditions, but in most cases this is in name only. When there is a relationship, the realization of these ragas tends to be distinct. Though this can be interesting for contrast and perspective, it is an advanced study. Even for those with a developed understanding of this music, recognizing a raga, as it is played, can be incredibly challenging. All of Indian Classical music utilizes a great deal of improvisation within a prescribed mode, though improvisation’s relationship to the structure of a raga varies between the traditions. One consistency between traditions is the presence of a drone used as a harmonic reference point to the raga being played. This is most often established using a tanpura, which is one of the most familiar sounds in Indian Classical music and is mesmerizing in its own right. It’s a stringed instrument with fixed notes, whose harmonic relationship to each other create a drone. Its strings are not played rhythmically or melodically, but in a fixed cycle. You will almost always hear it rising in the background of recordings. Though it is difficult to generalize, my intuitive feeling is that Hindustani music is a more internal, contemplative music than its southern relation. In many ways, though its concepts are harder to understand, it is my feeling that its music is easier to access for those unfamiliar with the musical traditions of India. Out of love and respect for both traditions, I’ve decided to dedicate time to each, but for the sake of ease and efficiency, to split this inquiry into two parts. In my own listening habits, I’ve had a longer relationship with Hindustani ragas, and have only started to explore Carnatic music during the last few years. It is logical to begin with the Hindustani tradition. I have a more developed understanding of it, and given that many basic cross between traditions, I will be better suited to introduce them here. I’ve tried to be as democratic as possible in my selections by including a diverse range of instruments and by representing both singers and instrumentalists. This is in some ways limited by my own knowledge, collection, and the time and space I have. I’ve done the best I can. In most cases, I haven’t chosen my favorite records, but the ones I feel are best suited as an introduction to this vast world. I do this out of respect for subjectivity, and my desire to expose and excite new listeners to as much as I can. As I mentioned, during the years I’ve listened to Indian Classical music, Hindustani recordings have made up the bulk of my collection. This is changing. Historically it has been led by what is available. This is something that will affect anyone beginning a collection of this music. Most recordings, across both traditions, were made for a domestic Indian audience, and have rarely left that country’s borders. If you are like myself, and dedicated to vinyl, collecting this music requires patience. Anywhere you choose to look, online or in shops, there isn’t much in circulation. It takes time to track things down. That said, there are a number of records by a group of core players within the Hindustani tradition which are inexpensive and easily found. I advise starting with these, and slowly building an understanding of what you like, both through individual players and in instrumentation – before venturing into the rare and expensive side of the market. All Indian Classical music evolved from ancient Hindu (Vedic) musical traditions. It is a deeply spiritual music – with links to the heart of that religion. The most important ragas are thought to have been composed by gods and passed into the hands of musicians. Hindustani music is the younger of the two primary traditions – having split off centuries ago and evolved separately under Persian and Islamic influence. Within a western paradigm of thought, the Hindustani tradition tends to be less fixed than Carnatic. It gives greater importance to the mood of a raga than its given notes. It also designates most of its ragas to times of day and to seasons. Where this is the case, a Raga should only be played during the time of day and year to which it is associated. If this is ignored, there is thought to be great spiritual consequence. It is incredibly hard to describe what defines a raga in the northern tradition. A Hindustani raga is not written, it is conveyed. Though a raga has an associated mode, that mode – and thus its associated notes, can be abandoned to better achieve what the raga sets out to offer. What a raga conveys determines its being, rather than notes. Capturing a feeling of time and the base principle of the raga is of primary concern. In most cases, within the Hindustani tradition, the same raga is unlikely to sound the same twice. Despite the tradition’s focus on mood and improvisation, there is an internal structure through which a Hindustani raga realizes itself. A raga is divided into two main sections, the alap and the gat. The alap is an introductory section which is usually an open form method of introducing melodies, scales and themes. The alap generally has four sections which guide its progression – the alap, mohra, jor, and jhala. The primary realization of a raga is called the gat. It is usually based on, and improvised from, three main lines – the sthay, manjha, and antara. A raga almost always begins slowly and builds in tempo as it progresses, all while paying strict attention to not stray from its intended meaning. Hindustani music carefully arranges its most important and spiritual music. There are six primary ragas – Bhairav, Malkauns, Deepak, Shri, Megh and Hindol, and ten basic thāts (best understood as scales)- Bilawal, Kalyan, Khamaj, Bhairav, Poorvi, Marwa, Kafi, Asavari, Bhairavi and Todi, which help define them. The thāt establishes a raga’s mood and relationship to time of day and season. Every raga has one thāt, but thāts appear in multiple ragas. Under each of the six primary (male) ragas, divided into a hierarchy based on the family unit, there are five “wives” which are called raginis, eight “sons” called putras, each with their own respective “wives”. Though I have no personal relationship to any religion, I think it is helpful to understand this music through the architecture through which it was conceived. Each of the primary six ragas and their respective raginis bears a relationship to a god, thus is played as an act of devotion. Within the devotional aspects of Hindustani music, and it should be understood that not all Hindustani music is devotional, one might consider a raga as a prayer – one which follows the rigorous rules of the religion in which it sits, while also being incredibly personal. It is important to remember that all of the primary ragas and their raginis are written to be sung, even when they are not. How Hindustani music defines a piece of music is not the same set of expectations found in music in the West. This is perhaps most striking when one addresses lyrical content. A raga generally does not have an associated set of lyrics, but rather is a definition relating to orientation of content, its musical scale, and most importantly its mood, spiritual meaning, and relationship to time and season. To orient a western and secular paradigm to Hindustani music, I will use a very simple illustration. Take the song Happy Birthday. This piece of music is defined through a fixed arrangement of notes and lyrics. We know it is Happy Birthday because these aspects are constant. If the notes, melody, and lyrics change, it is no longer Happy Birthday. It’s another song. That understood, the song itself could be sung or played in an infinite number of moods. You could effect sadness, happiness, or any emotion between. As long as the lyrics, melody and notes remain, it is always Happy Birthday. To understand the characteristics of Hindustani music, you could invert this set of definitions. Happy Birthday is a song which, in its inception, sets out to celebrate a person’s birth with joy. It is this mood and intent, that would define a piece of music in the Hindustani tradition, rather than its notes, lyrics or melody. Over time, an understanding would develop of the best harmonic realization of this mood and orientation. This ultimately becomes the thāt. When the defining terms of a piece of music are established, the terms of its thāt are met, and thus its mood is achieved – it is that piece of music. Happy Birthday could have an infinitive number of realizations, all of which achieve the same end. Of course Happy Birthday could never be a raga. It does not fit the terms of definition. This is a gross generalization and a disregard for context. I hope you will forgive me that, in my efforts to shift your understanding toward a different paradigm of conceptualizing a piece of music which is very hard to illustrate. Though Hindustani music is generally devotional, it embraces religious neutrality. It is a music of Hindu origin, which musicians of multiple faiths practice. Muslim players can sing praise of Hindu deities, and Hindu players of Allah. Ragas are passed from teacher to student (vs written), and thus are subject to a greater range and evolution of interpretation. The tradition has a great deal of variety, many schools of thought, methods of approach, and represented instruments. I’ve done my best to offer the broadest range of these possible, while choosing as many recordings easily available on the western market. I’ve also tried to use these recordings as directed explorations of some of the concepts found within this music, rather than embark on separate explanations. Though it inevitably stretches the length of discussion given to each album, I hope this will be useful, particularly if you explore the recordings on your own terms and return to this piece of writing as a standing resource. This record is wonderful. During my early explorations of Indian music, the sarod playing of Ustad Ali Akbar Khan reached out and drew me in. It was his playing, more than anything else, that gave me entry. I adore everything about his music. Few evoke as much in me. I own a couple dozen of his records and will carry on until I own them all. I’ve chosen Morning And Evening Ragas because it was the very first Indian Classical record I bought, and because it’s easy to find and inexpensive. I’ve seen hundreds of copies in my travels, thus it’s a good place for others to begin as well. It also raises a minor digression, which might be useful. 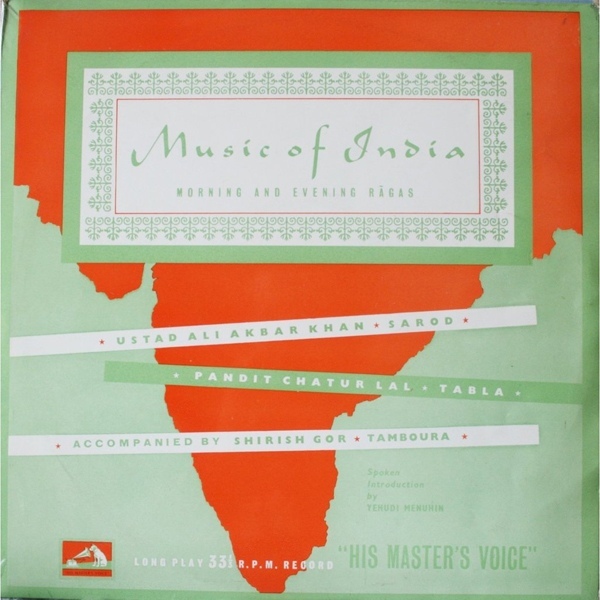 Many Indian Classical records have multiple issues on different labels and with different covers. I accidentally bought two copies of this album during the same month. It was reissued in 1965 by Capital as part of a series of Indian recording they produced for American listeners. It’s worth watching out for these, both to avoid confusion – they all are reissues of earlier releases, but also because they are inexpensive and in general circulation. This album helps to highlight another source of potential confusion. Given the nature of Ragas and their relationship to times of day and seasons in the Hindustani tradition, titles of albums can be confusing. There is an album by Khan from 1965 issued by Connoisseur Society under the same name, but is not the same set of recordings or ragas. Discogs can be a very useful tool for cross reference, and I would advise familiarizing yourself with the (multiple) covers belonging to the records you are looking for. It also should be noted that Khan, like many other musicians, recorded variations of the same ragas, each radically different and as worthy of your attention as the next. Ali Akbar Khan was born in 1922 and passed away in 2009. He was India’s most famous sarod player, and part of a small group of musicians who should be credited with not only building the prominence of Hindustani music in their own country, but also in the rest of the world. He comes from an old and respected family of musicians. He and Ravi Sharkar (who was both his cousin and brother in-law) studied under Khan’s father Allauddin Khan, who during that period was one of India’s most prominent musicians. Ali Akbar Khan was designated a master of his instrument and the form at a young age, and thus bore the title of Ustad. This is the highest order of merit for a Muslim player (vs its equivalent Pandit, given to Hindu players). His instrument – the Sarod, is from the Indian continent and most closely resembles a lute. Like a number of Indian stringed instruments, it also has resonant, sympathetic strings. It’s sound is incredibly beautiful, rich, with an inherently sad and inwardly thoughtful quality. Not only was this album my entry unto the world of Indian Classical Music, but the same for the entire western world. It is the first LP (vs 45 or 78) of this music ever issued, and the first time it was recorded for a western audience. In 1955 Ali Akbar Khan performed in New York, the response to which was overwhelming, and sparked the beginnings of a western curiosity about India’s rich musical traditions. This album was a direct result of that interest, and was made in some part to fulfill it. Accordingly, it has its own significant history, which I imagine accounts for its prevalence in record bins. Morning And Evening Ragas features two ragas which are useful in their dichotomy to display some of the differences between ragas. It begins with Raga Bhairavi, one of the 6 primary ragas. Bhairavi is a deity (depicted as female) within the Hindu religion who is fairly terrifying. The raga itself is to be performed in the early morning, and is one of only a handful that has no seasonal determinant – meaning it can be played at any time of year. It is characterized by its great power and compassion. It is defined by its own thāt which is peaceful, serious and sometimes has a sad or sorrowful mood. Khan’s realization of it is beautiful and mesmerizing. Far beyond my words. He has managed to both capture the sensitivity of the raga’s thāt, while embodying all of the fury and terror of the god with whom this raga shares its name. The second (and final) piece on this album is Raga Piloo. Piloo is neither one of the 6 primary ragas or a member of any of their respective “families”. It sits within a subset of Hindustani music called Khyal. This tradition is less (and often not) devotional. Ragas such as these are often referred to as light-classical. This term is not a reflection of the seriousness of a musician’s approach. It is an indication that, though they follow the architecture of a raga, in not being strictly devotional – they are not held to the same rigorous standards found within the primary six and their families. They are celebrated for their openness and flexibility, and as a result have a great deal of popularity with musicians. One interesting difference within Khyal is that though the musical range is far more flexible than other forms of raga, when sung – its lyrics are usually fixed. These tend to draw from short poems, and though the text itself remains constant, the way it is sung rarely does. As I understand it, this is an evolutionary practice which has grown over time, rather than a prescription of the tradition itself. This has no bearing on the recording at hand, since it is instrumental, I offer it as both an illustration of the breadth within Hindustani music, and to give a wider understanding of Khyal when you encounter it. Raga Piloo is to be played in the late evening, during the monsoon season, and is a peaceful raga. Of the two ragas on this album, Piloo draws me in further. It is imbued with a delicate sadness, somehow displays the great depth of Ali Akbar Khan’s sensitivity as both a man and a player, and takes you on a narrative journey without words. To my knowledge this is the second Indian Classical LP ever recorded. Like Ali Akbar Khan’s, it follows the success of its player in front of American audiences, and was made for western listeners. Shankar toured the States for the first time in 1956. Unlike Khan’s album, this album entered my collection fairly recently, and represents a more complex dichotomy within my personal collecting. Despite their ubiquity, not only did I avoid buying Ravi Shankar records for many years, but also recordings of his chosen instrument – the sitar. There are reasons for this. Despite its beauty, the sitar has suffered from aural fatigue in the west. It was overused in 1960’s psychedelic music. Though musicians of this era brought wider audiences to Indian music through their use of the sitar, this had the opposite effect on me. I love psychedelic music, but to my ears, the sitar is a signifier of its cheesiest realizations. Few things could make me drag the needle from the groove faster. When I began to explore Indian music, its sounds were the hardest for me to accept, as was the man who first brought them to the west. Ravi Shankar’s presence in western popular culture, made him hard for me to trust. Two factors changed this. I bought a few albums by other sitar players (Vilayat Khan and Nikhil Banerjee), and Ali Akbar Khan’s duets with Shankar. In both cases I was moved by what I heard, and my relationship to the sitar began to soften. 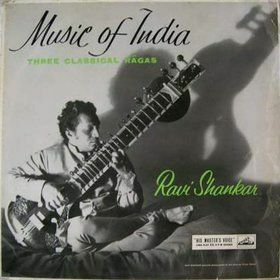 Like Morning And Evening Ragas, Three Classical Ragas is not necessarily my favorite recording by its respective artist, but chosen because I think its a great place to start, and it is both widely available and inexpensive. The cover pictured is of the first pressing – which I own, but is the least common of its issues. It was reissued in the 60’s by both Capital and World Pacific, and then again in the 70’s on Angel – each with its own distinct cover. Familiarize yourself with these to avoid confusion. The most common is the World Pacific issue, and should only cost a few dollars at most. Pandit Ravi Shankar was born in 1920 and died in 2012. He is probably the most famous of all Indian musicians in the west – resulting largely from his association with The Beatles, and extensive touring. Shankar came from an upper cast family, but unlike Ali Akbar Khan, not one of long historical lineage in music. His brother Uday was a theater performer, and it was as a member of this troupe that Shankar began playing instruments as a child. Despite my increasing affection for his playing, and Shankar’s extensive formal training, I do feel that this early incarnation of his career sets the tone for his life as a musician. His playing is much more outward and performative than many of his peers. It has never struck me as having the level of depth and introspection. One common aspect of sitar playing, which I sometimes find myself resistant to, is its tendency to display flourish and the virtuosity of its players. It can lead the listener toward itself and to the player, rather than into the depth of meaning and emotion within a raga. Of all the sitar players I am aware of, Shankar can be most guilty of this, and though I encourage you to start here, I also would advise you not to allow this to be the only relationship with the instrument that you establish. One of the reasons that I feel this album is a great place to begin with Shankar, is that it does a great job achieving what it set out to – which is introducing its listeners to the diversity within the raga tradition and within the sitar itself. As its title describes, this recording features three ragas – Raga Ahir Bhairav, Raga Simhendra Madhyaman, and Raga Jog. Raga Ahir Bhairav is a morning raga, which is an adaptation of an ancient raga and raga Bhairav – one of the six primary ragas, and related directly to the Lord Shiva. Bhairav is a deeply serious and devout raga. It featured many recordings, so you are likely to encounter it again. Shankar’s development is slow and restrained, carefully building over its duration, not unlike the morning prescribed by its thāt. It’s both an incredibly beautiful piece of music and displays the range and intricacy within Shankar’s playing. The second piece of music we encounter is Raga Simhendra Madhyaman. This raga seems to be one that has entered the Hindustani tradition from the Carnatic. This is something that happens with some frequency because Carnatic ragas, though imbued with the same spiritual significance, are not linked to times of day and season, thus performers can play them with less restriction. This is probably my favorite raga on this recording. Shankar’s realization of it is incredibly powerful and drenched in emotion. His playing feels direct and focused and with less embellishment than I might usually expect. The final raga is Jog. Jog is a very popular evening raga. Here we find Shankar in full form and displaying all the virtuosity from which his fame grew. This realization is incredibly complex and swells to breakneck speeds. Despite not possessing what I often am most drawn to in ragas, it is an incredible display and overwhelming in its own right. Despite offering this album as a great introduction, I would recommend continuing your exploration of Ravi Shankar further, particularly because, unlike many players of Indian Classical music, his recordings are easily obtained. It is my feeling that his playing got better as he grew older and grew in emotional depth and weight. I adore this album. Jugalbandi is the general term within Hindustani music for a duet, is very popular within the tradition, and has no distinction to instrumentation. You’ll encounter it regularly. 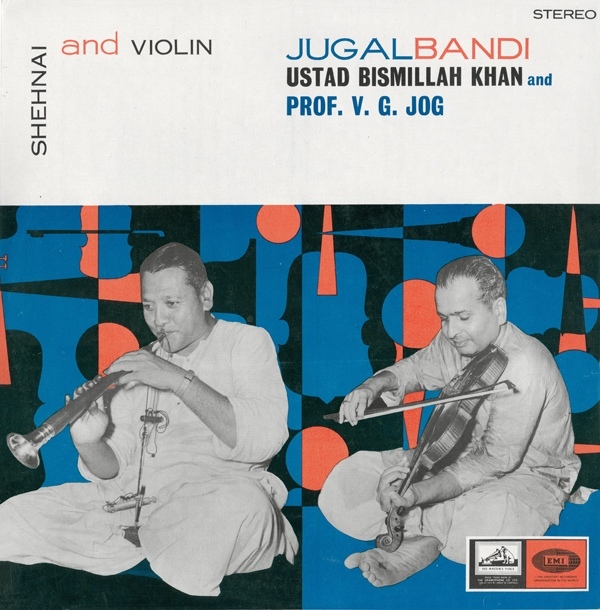 Bismillah Khan, and V. G. Jog made a number of records together. It was these recordings that opened up my interest in Khan’s instrument – the shehnai, and allowed me to approach it on its own terms. Despite Bismillah Khan being one of India’s most famous musicians, the shehnai is not well represented in the Hindustani tradition. It is generally used in folk music. In classical recordings, he is one of a handful who play it. It is a double-reeded flute which sounds similar to an oboe. Though it is obscure in the Hindustani tradition, Carnatic music has a similar instrument called a nadaswaram, which is very common. Likewise, the violin is fairly unusual in the Hindustani music, but is one of the primary instruments within the Carnatic tradition. Thus, despite their fame, these two players represent something of an anomaly within the northern tradition of Indian Classical music. During his lifetime, Ustad Bismillah Khan was one of India’s most famous musicians. His recordings, with those of with Ravi Shankar and Ali Akbar Khan, are the most likely to be encountered in the west. He was born in 1913 and passed away in 2006. Like Ali Akbar Khan, he was Muslim, from a long line of famous musicians, and began the study of his instrument in early childhood. His discography is vast and worthy of your time. Not only was Vishnu Govind Jog one of the few, and most famous players of the violin in the north, but he is generally credited as having introduced it into Hindustani music. He was born in 1922 and passed away in 2004, having spent most of his career in the spotlight. He was applauded for his versatility, the sensitivity of his playing, and for his efforts as an accompanist, as much as a solo player. His discography is small for a musician of his stature. Most albums which feature him are jugalbandi. Only three releases are dedicated to his solo efforts, but in my opinion, everything he touched was gold. Over the years I’ve considered how much a respective instrument effects your relationship to a raga, and how much that instrument brings to the raga itself. There isn’t any empirical way to relate this, particularly in a tradition with so much improvisation within ragas and diversity of tone within its instruments, but I do feel intuitively that each instrument brings a raga into its own world. In many ways, this is why I’ve tried to represent as many instruments in this piece as possible. Though almost all Hindustani music relates itself to the human voice, each instrument’s realization of this, offers a distinct reality – some of the most unique of which are found on recordings such as this one. When listening to Khan’s shehnai and Jog’s violin ripple against each other, it is easy to start to understand why the tones of their instruments are more common in the the more spiritual and ecstatic Carnatic tradition. They are both imbued with a density of emotion of which it is hard to find equivalent. Neither of these instruments is disposed to settling themselves into ambiance. They are riveting. One of the more complex aspects of Indian Classical music, when approaching it from a western point of view, is found in its harmonic relationships. In western music, consistent pitch between instruments is of paramount concern, and is based on a rigid intonation of respective instruments. If an instrument’s notes drift from this rigid structure, they are considered “out of tune”. Indian classical music has a much more complex concept of intonation called “raga svaroop”. Within this, there is an understanding of harmonic interplay, which is a more developed understanding of, and willingness to approach, the emotional range of a more open concept of intonation. From a strictly structural point of view, this not only acknowledges the potential of a note when it goes flat or sharp, which western music largely excludes, but also the harmonic power of a note, which is flat or sharp, ringing against a note which is not of equal temperament. It is this understanding, brought out by rigorous fine tuning, which brings the life and soul (jiva) to a raga. Indian classical music focuses more on the harmonics around a note rather than its specific locality, as well as the harmonic situation that arises and is specific to the relationship of multiple notes. Thus the Indian word for note – swara, does not have the same technical meaning as it does in the west. It is a far more conceptual being, and relates to what a note does as much as to what it is. This might also help you understand choices of instrumentation. In small musical arrangements within the western traditions, instruments are usually chosen for their ability to distinguish themselves from each other, either through timber or register. Each member of a collective tends to occupy a narrow field within a broad representation of registers and tones across the spectrum. In Indian classical music, because of the close interplay between the pitch of notes and subtle harmonic relationships, you often find instrumental relationships that bleed into each other, and give way their harmonic distinction. In stringed instruments this is often achieved through that instrument’s sympathetic strings’ proximity in tone and pitch to those of the tanpura, and on recordings such as the one we are now discussing, between the surprising tonal relationship between the violin and the shehnai. The relationship between the two primary instruments on this record is overwhelming, and in many ways shocking. If left to blind presumption, you would assume, given their inherent nature, that they would display jarring contrast. Not only are they incredibly close, in timber, harmonics and range, but their interplay is seamless. When listening to all of the recordings of these two musicians in jugalbandi, I have been consistently struck by how often I lose track of which instrument I am hearing, and how wonderfully one player binds himself to the other. What happens within these recordings is unlike anything I can call to mind within western traditions. It is overwhelming and totally mesmerizing. This album features three pieces of music, Raga Jai Jaiwanti, Raga: Bahar, and Dhun In Mishra Khamaj. The first piece, Raga Jai Jaiwanti, in the hands of these two musicians, is astoundingly beautiful. Easily one of my favorite renditions of any of the ragas I own. Jog and Khan push each other, and respond with profound sensitively. Their discourse is thrilling and sends chills down my spine. Raga Jai Jaiwanti also raises further complexities within the Hindustani tradition. This raga is a hybrid of two others – Raga Sorath and Raga Bilaval. The adaptation and ultimate formation of new ragas from older ones, is something that happens frequently, and is one of the key ways that new ragas enter the tradition, and one where the ragas are attributed to an individual. Given my cultural distance from the tradition, and the limits of my own knowledge, I’m not sure what the spiritual effect of such a hybridization is, but I would imagine it moves the raga toward a “light-classical” structure. The second piece, Raga: Bahar, I know very little about, but is also incredibly beautiful and engrossing. Like this album’s first, the third piece of music is also a good illustration of the diversity within Hindustani music. Mishra Khamaj is a Dhun, the closest literal translation of which is tune. Dhuns have no specific prescription on how they should be played, thus they can be adapted into “light” ragas or other forms of musical construction within the Hindustani tradition. They are part of a complex tradition of relationship between the higher classical architecture and folk idioms. Most Dhuns are designated as “kshudra” which are pieces of music whose origins stem from folk traditions. Though you are less likely to encounter them in recorded formats, they are very much part of the Hindustani tradition in different iterations. They are loved by musicians both for their dichotomy between “high” and “low” and their openness and versatility. Because Indian Classical music rarely extends into large ensembles as it does in the west, jugalbandi is one of the great forms to explore the depth of interplay between musicians. This album is a wonderful place to start with this tradition, both because of the relationship between the musicians, but also because of the tonal relationship between their instruments. It displays so much of the potential held within this form. Simply put, this album is incredible. As with my other selections, I recommend that you do not limit your exploration of them to this album alone. Each is remarkable and offers incredible depth to the instance you explore them. The sarangi is possibly my favorite instrument in the Hindustani tradition, and sadly one of its least recorded. It is is a bowed string-instrument, which is recognized for its proximity to the human voice. It sounds similar to a violin, but has more strings, some of which are sympathetic, and a different bridge construction – all of which allow for a greater resonance and color. Historically, it is more closely aligned with folk traditions. Pandit Ram Narayan is its most famous player, and credited with popularizing the sarangi in Hindustani music. He was born in 1927 and is still working today. Like most Indian Classical musicians, Narayan comes from an upper cast, and began his study at an early age. Unlike many of his peers he studied with many teachers across a broad range of disciplines, and was not quickly acknowledged for his talent. Because of the nature of its tones, the sarangi is often encountered as an instrument for accompanying the human voice, rather than a a solo instrument. 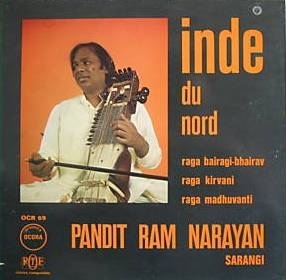 This accounted for some of Narayan’s difficulty in gaining recognition for his playing, and also some of the reason for its rarity within recorded media as such. The instrument has a deep sorrowful sound which brings a remarkable depth of emotions to a raga. For more than a half century, Pandit Ram Narayan has made a great many albums for the Indian market. Unfortunately, these tend to be incredibly hard to find. His recordings for the French label Ocora are most commonly encountered in the west. Though Ocora generally released albums of field recordings from around the world, during the 70’s and 80’s they also produced a run of studio recordings by Indian Classical musicians. These are worth keeping an eye out for – though many are not as inexpensive as they ought to be, given the popularity of Ocora’s output with record collectors. This album generally fluctuates between $10 and $20, though you might get lucky and find it for less. The album begins with a variant of Raga Bhairav, which we have already encountered on the Ali Akbar Khan entry. It is one of the primary six ragas. Though the two ragas that Khan and Narayan play are technically different, and based on the same root, this still might be a good place to listen to the range through which a raga can realize itself, both in instrumentation and in the hands of different players, particularly because both the sarangi and the sarod are deeply emotional instruments which lend themselves to somber moods. Narayan’s rendering of it, though very different than Khan’s, is incredibly beautiful. This album is a great place to begin, not only with one of my favorite players, but with one of my favorite instruments. This is one of my favorite recordings within the entire cannon of Indian Classical music. Of all the remarkable singers who came to prominence in India over the course of the 20th century, Ustad Amir Khan is probably my favorite. Of his 6 LPs, this one rises to the top. It is a profoundly moving piece of work. Given Khan’s importance to me, and my desire to include some aspects of the vocal traditions within Hindustani music, I am compelled to include this. Unfortunately, this album, like all of Khan’s recordings, will not render itself as easy to find as my previous entries. Over the years, I’ve noticed a strange and unexpected characteristic within my own listening habits. Despite my love for music centered around the human voice, my natural disposition is toward instrumental music. When listening to vocal music, I rarely pay attention to lyrical content. Words fall away, while notes, phrasing, and the humanity remain. I don’t have an explanation for this. It’s a disposition – possibly a fault, but not a value judgment. When it first came to light, I began to inquire toward how I was listening. How was I missing the words? If not words, what was I hearing? I discovered that I hear the voice as an instrument, and that, for better or worse, shifts how I approach what I hear, away from a popular paradigm. This might sound absurd and somewhat negligent. I assure you, it was not something I did consciously. In ways, I wish it wasn’t the case. Like many disabilities, its constraints have been matched by a strength. This disposition has lead my ears toward music hidden from view, and fostered a love for sounds of cultures far beyond my own. Without language as a barrier, there is meaning beyond words. I imagine that it was this that allowed me to approach the vocal traditions of Indian classical music without skipping a beat. 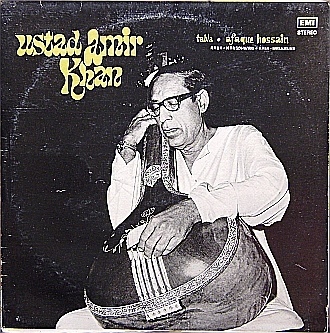 Ustad Amir Khan was born into a family with a long and esteemed legacy in music. During his brief life, he was one of the most beloved voices in Hindustani music. Since his death in 1974, his reputation has continued to grow. Khan represents the most serious end of the tradition. His devotion to his craft was with few parallels. He focused his efforts toward perfecting the ragas within the primary tradition – those with most spiritual depth and consequence, and tended to ignore lighter pieces. His singing is incredibly distinct. It occupies the lower octaves, and drifts slowly into being. He was renowned for the latter. His approach to a raga tended to be slow, both in tempo and development. His singing is somber and contemplative, imbued with spiritual depth, without embellishment. He focused his energies on the most powerful meaning, and stripping everything else away. He offered no distraction or regard for virtuosity. His approach was austere. Unlike many singers, he rarely used accompanying musicians, preferring to accompany himself on tanpura alone. This allowed his voice to gain greater focus. Though he only left behind a handful of recordings, his impact on the listener, and on the tradition as a whole, is incalculable. This album features recordings of two well known ragas – Hansdhwani, and Malkauns. Raga Hansdhwani is interesting because it does not have roots in the Hindustani tradition, and represents a larger movement of northern musicians borrowing from the Carnatic tradition. This rarely happens in reverse. Though this rendering is more austere than most, and arguably is my favorite, it’s still easy to recognize elements which feel unfamiliar within the Hindustani tradition. It’s approach toward spiritual meaning, and how that is realized through its notes, feels markedly different. It feels lighter, less contemplative, more outward and ecstatic. When nestled against another, as it is here, it is an interesting illustration of some of the structural differences between the two traditions. Khan’s rendering of it, is more inward and reflective, than is usually exhibited in Carnatic ragas. It takes his singing to very interesting places. That said, for my money, this albums true value is compressed into its second side where we find Raga Malkauns. This is Khan at his height. It’s incredible. I’m tempted to step away, say nothing about it, and let you sink into its depths without obstruction. Malkauns is one of the oldest ragas in all of Indian Classical music. It features on countless recordings, so you will encounter it frequently. It is a raga which is very slow, serious, contemplative and disposed to the lower octaves, thus is one which lends itself to Khan’s disposition. It is a thing of profound power and beauty. The height of singing in the Hindustani tradition. It feels like a sorrowful prayer drawn from deep inside it’s singer. One made without regard for an audience, but one that pulls us along through its highs and lows. I cannot recommend this record enough. With Amir Khan, the Dagar Brothers represent some of the highest, and most serious realizations of vocal music within the Hindustani tradition. They were the foremost proponents of a form called Dhrupad. Dhrupad is the oldest form of Hindustani tradition practiced today. It is austere, slow and incredibly serious. The Dagar family makes of one of the central schools of thought within it, dating back at least 19 generations. 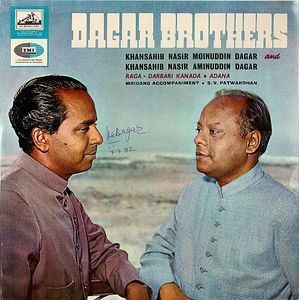 Nasir Moinuddin Dagar and Nasir Aminuddin Dagar, the two brothers featured on this recording, are credited with reviving the form from obscurity and bringing it back into popular practice after centuries of neglect. Recordings of the Dagar Brothers are not common. Other than an album released as part of UNESCO’s world music collection, this is the only LP that I am aware of. To avoid confusion, there are two sets of Dagar Brothers – the two featured here, sometimes referred to as the Senior Dagar Brothers, and Nasir Zahiruddin Dagar and Nasir Fayazuddin Dagar, who are often referred to as the Younger Dagar Brothers. Both sets of brothers belong to the same family and tradition, but are different singers. The younger brothers are more well represented by recordings. This album is profound, powerful, incredibly austere, and like most recordings by the two sets of brothers, is Jugalbandi. The album begins with Raga Darbari Kanada, which though thought to originate in the Carnatic tradition, is one of the most severe and serious in the Hindustani tradition. Unlike most ragas that come from the Carnatic tradition, it has a prescribed time of day. It is to be played during the night. It is considered to be one of the hardest ragas to master. The Dagar’s rendering of it is one of the most profound that I am aware of. Every syllable they utter wraps itself around my heart and drags me toward them and into the raga itself. No matter how many times I listen to it, their voices bring me inexplicably close to tears. The second entry is Raga Adana, which is a derivation of Raga Kanada. It is less austere, but compared to other ragas in the tradition, should be considered as being very serious. It brings me no less emotion to Kanada in this realization, despite their bearing little resemblance to each other. The raga itself allows for faster passages, and the brothers utilize this, taking us on a thrilling journey with their profound vocal ability. This is easily one of my favorite albums between both traditions of Indian Classical music, and because of this forced me to abandon my modus of trying to focus only on easily accessible records. This album is rare and often expensive. Despite this, I encourage you to begin looking for it – you may get lucky. In the mean time, I would also direct you toward the album I mentioned issued by UNESCO. It is fairly common and no less worthy of your time. This concluded the first installment of my introduction to Indian Classical Music. The second, dedicated to the southern tradition, or Carnatic music, is to follow. I hope this has been helpful in achieving what I set out to, and has been as informative and interesting to read as it was to write. A very good selection – and some judicious comments on Shankar and the sitar! As a shout out, one of my favorite Karnatic vocal tracks is on UNESCO Collection India IV (BM 30 L2021). Track #3 Navarasa sung by Semmangudi Srinivasa Aiyar. Placidly static and pyrotechnic, muscular and delicate, warm and haunting all at the same time: feels virtuosically tight and playfully free. I too have a large collection of Indian recordings (mostly downloaded!!). Good to hear from a fellow westerner with a similar passion. Any more record recommendations?? I’ll check it out-thank you! !